Little, Brown Books for Young Readers, 9780316008105, 432pp. 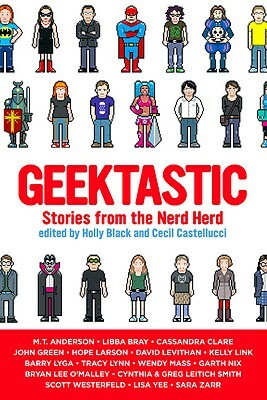 Acclaimed authors Holly Black (Ironside) and Cecil Castellucci (Boy Proof) have united in geekdom to edit short stories from some of the best selling and most promising geeks in young adult literature: M.T. Anderson, Libba Bray, Cassandra Clare, John Green, Tracy Lynn, Cynthia and Greg Leitich Smith, David Levithan, Kelly Link, Barry Lyga, Wendy Mass, Garth Nix, Scott Westerfield, Lisa Yee, and Sara Zarr. With illustrated interstitials from comic book artists Hope Larson and Bryan Lee O'Malley, Geektastic covers all things geeky, from Klingons and Jedi Knights to fan fiction, theater geeks, and cosplayers. Whether you're a former, current, or future geek, or if you just want to get in touch with your inner geek, Geektastic will help you get your geek on! Holly Black is the bestselling author of contemporary fantasy novels for teens and children, including Tithe: A Modern Faerie Tale and the #1 New York Times bestselling Spiderwick series. She has been a finalist for the Mythopoeic Award and the Eisner Award, and the recipient of the Andre Norton Award. Holly lives in Massachusetts with her husband, Theo, in a house with a secret library. Her website is www.blackholly.com.